We investigate the mechanisms of speciation and adaptive radiation with a focus on processes that take place within lakes, in parapatry or sympatry. We wish to understand the intrinsic evolutionary constraints to speciation as well as the environmental triggers of speciation. We think it is most often the interaction between intrinsic lineage traits and extrinsic factors that determine the extent of diversification and adaptive radiation that a lineage may achieve. Whenever possible we study the entire speciation continuum from the incipient stage of speciation with very incomplete extrinsic postzygotic and premating isolation to completely isolated sister species and fully fledged adaptive radiations all within the same evolutionary lineage. African cichlids are excellent for this, as are stickleback, char and whitefish in high latitudes. We combine investigations into the ecology, behavior, morphology and natural history of populations and species with population genomic analyses of adaptation and isolation and with phylogenetic analyses of evolutionary relationships. We investigate the roles of different agents of ecological and sexual selection, the role of ecological opportunity, evolutionary innovation and interspecific hybridization in speciation and adaptive radiation. We have been studying the radiations of haplochromine cichlid fish in African lakes for more than 25 years. Currently we work mostly in Lake Victoria, Lake Mweru and some other smaller lakes. These radiations are the largest and fastest known animal species radiations on Earth. We have shown that speciation is driven by strong interactions between natural and sexual selection, and that unusually large standing genetic variation and ancient hybridization events facilitate this. We have also shown indications of a latitudinal gradient in adaptive radiation with more radiations at lower latitudes. We are studying several other young lacustrine radiations of fish in temperate and cold climates. Our focus are whitefish and char in the deep subalpine lakes on the feet of the European Alps. Many species are endemic to single lake chains and have evolved in the past 15’000 years. We study the entire fish assemblages of these lakes in order to learn about the interactions among lineages, and the roles of immigration and speciation in community assembly. We are studying Threespine stickleback, a major model system in evolutionary and ecological genomics. We capitalize on the circumstance that the large lakes and associated streams of Switzerland have only been colonized by stickleback in the past 150 years. We have shown that colonization involved several distinct lineages from distant parts of Europe that have admixed their genes to various extents in different parts of Switzerland. We have also shown that genetically and phenotypically distinct ecotypes have evolved despite gene flow in several lake systems of Switzerland, suggesting incipient speciation. We seek to understand the ecological and behavioral mechanisms that drive this very early stage of speciation and the sources of the genetic variation that facilitate it. Much of organismal diversity is thought to have evolved in bursts of adaptive radiation - periods of rapid speciation associated with diversification into a multitude of ecological niches. Studying the mechanisms of adaptive radiation and the factors that shape it is central to understanding the origin and structure of species diversity. Adaptive radiations are are a composite phenomenon, characterized by a complex series of successive processes, starting with invasion followed by adaptation and speciation, and ending with evolutionary community assembly into many sympatric species as four critical stages that lead to a fully fledged adaptive radiation. We use next generation sequencing, bioinformatics and population genomic modeling to investigate genetic constraint and facilitation of the four critical stages in a single analytical and conceptual framework. We study adaptive radiation processes in stickleback and cichlid fish, having occurred over different time scales :from 100 years (Swiss invasive sticklebacks), to several tens of thousands of years (older clades of Lake Victoria cichlids). Sticklebacks and haplochromine cichlids share an unusual propensity to rapid speciation, orders of magnitude faster than in most other animals. Yet haplochromines and sticklebacks markedly differ in their ability to generate sympatric species diversity. Stickleback have radiated into hundreds of very young species distributed over all the coastal regions of the northern hemisphere. However, most species pairs diverged just a few thousand years ago, while older species are very rare, and there are never more than two species in any one site. On the other hand, haplochromine cichlids have also radiated into hundreds of species, but tens or hundreds of species, often not much older than the stickleback species, can be found sympatrically at a single site. We are investigating genomic variation, its origins and the architecture of adaptation and reproductive isolation in these two taxa. Sticklebacks and haplochromine cichlids share an unusual propensity to rapid speciation, orders of magnitude faster than in most other animals. Yet haplochromines and sticklebacks markedly differ in their ability to generate sympatric species diversity. Stickleback have radiated into hundreds of very young species distributed over all the coastal regions of the northern hemisphere. However, most species pairs diverged just a few thousand years ago, while older species are very rare, and there are never more than two species in any one site. On the other hand, haplochromine cichlids have also radiated into hundreds of species, but tens or hundreds of species, often not much older than the stickleback species, can be found sympatrically at a single site. We are investigating genomic variation, its origins and the architecture of adaptation and reproductive isolation in these two taxa. Environmental heterogeneity in spatially continuous habitats such as a lake will likely often enforce a rugged multimodal adaptive landscape on populations, yet at the same time create little opportunity for spatial isolation between tenants of alternative peaks in the adaptive landscape, causing a situation in which a Environmental heterogeneity in spatially continuous habitats such as a lake will likely often enforce a rugged multimodal adaptive landscape on populations, yet at the same time create little opportunity for spatial isolation between tenants of alternative peaks in the adaptive landscape, causing a situation in which a panmictic population experiences disruptive selection. Evolutionary response to such disruptive selection is constrained by homogenizing gene flow and indeed good examples of sympatric speciation are still rare. Yet, while most taxa fail to speciate altogether in such circumstances, some radiate into many new species with predictable regularity. Despite one and a half centuries of speciation research, surprisingly little is known about the causes of this differential response. 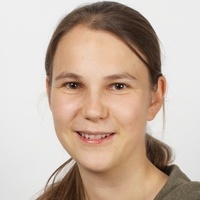 Absence of radiation may be because populations of many taxa fail to adapt to disruptive selection in the face of gene flow, but alternatively, taxa that do not radiate may not experience disruptive selection to begin with, or they may adapt through mechanisms that do not require speciation. Few studies have explored these alternatives in the same system. In this project we are doing just that. While some haplochromine cichlid lineages have repeatedly radiated in lake environments, others consistently fail to diversify. This is an ideal system to study constraints to speciation. We investigate pairs of sister species that have diverged between contrasting habitats and other pairs of populations that have not speciatied but occupy the same or similar habitat contrasts. We estimate fitness functions in the wild for phenotypes and genotypes in contrasting habitats and adaptive landscapes for populations. We are using Next Generation Sequencing technology to sequence genome-wide markers for a large sample of these individuals. This will allow us to measure the total magnitude and genomic distribution of response to disruptive selection between habitats in cases with and cases without speciation. Third, are making laboratory crosses between speciated and non-speciated populations to map traits that are under selection. Combining these approaches will allow us to test predictions of alternative models of adaptation and speciation with gene flow. Marine fish were long thought of as not doing geographically localized adaptive radiations. However, the geologically young Mediterranean Sea does host several small to moderately sized species radiations. One of them occurs in the European wrasses (Labrinae) with some 15 species in two largely endemic clades. 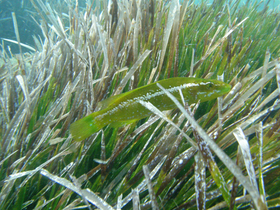 Many of the species in both clades share a very remarkable phenotypic polymorphism with brown morphs that tend to live among rocks, and green morphs that are strictly associated with Posidonia seagrass. Little is known about the genetic mechanism that permits such remarkable polymorphism in full sympatry. The polymorphism may be due to phenotypic plasticity or developmental plasticity, may have a simple Mendelian genetic basis, or more complicated mechanisms could be at work, including speciation. We are investigating this polymorphism, using next generation sequencing to test for genetic differences between morphs. Once upon a time was a species that colonized a new environment, e.g. a newly formed archipelago or a lake, providing a variety of different, unexploited resources, where it rapidly diversified into a suite of species adapted to use their environment in different ways. This is the classical story of adaptive radiation (Simpson, 1953). Now imagine that not one, but two species from two distant lineages which are both known to sometimes radiate when each occurs alone colonize such a new environment at around the same time, perhaps even more than two. How do they partition niches among each other? Or do they? Do they diversify independently or do they constrain or promote each other’s diversification? We are addressing these questions studying unusually diverse assemblages of whitefish and char coexisting in the same young pre-alpine lakes. 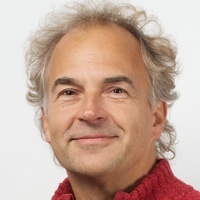 Identifying mechanisms of speciation has proven one of the most challenging problems in evolutionary biology, perhaps mainly for two reasons, speciation in sexually reproducing diploid organisms is not readily accessible to experimental approaches, and rarely to time series analyses. Any one case of speciation can usually be investigated only at a single stage of completion, which makes it impossible to isolate cause and consequence of divergence and differentiation. The cichlid fish species Pundamilia pundamilia, Pundamilia nyererei, their hybrids and intermediate colour morphs occur at various stages of differentiation at different islands placed along an environmental gradient of water clarity in Lake Victoria. At the same time, populations occurring at different islands do exchange genes as is evident from our work using microsatellites, AFLPs and SNPs. Hence, the Pundamilia system comes close to the ideal case where variation in stage of speciation can be studied in the same pair of species and along a continuous series of differentiation. As such, it allows us to identify the minimum set of traits that have to be under divergent selection to recruit and/or maintain non-random mating. We have investigated this system for more than twenty years, with our first papers published in 1997. We have studied the ecology, mating behavior, aggressive behavior and territoriality, parasites, visual system, gene flow and selection and phylogenetic history combining a wide range of methods and brining in several collaborating labs. Six PhD students have graduated with dissertation research that was based mostly on this system. A number of conclusions can be drawn from the investigations carried out to date. 1. the most turbid sites are inhabited by a single species with variation in colour and mating preferences: colour and preference phenotypes both have a unimodal frequency distribution; there is no association between colour and microdistribution or alleles at visual genes, nor is there genetic differentiation between the phenotypes at neutral markers. The clearest sites are inhabited by two different species: colour and preference distributions are strongly bimodal with few or no intermediates; colour is strongly associated with microdistribution and with alleles at the long wavelength sensitive opsin gene (LWS): Red males and females that prefer mating with red males live deep and have fixed an LWS allele that makes them sensitive to the red-shifted ambient light in their habitat. Blue males and females that prefer mating with blue males live shallow in rocky crevices, and have fixed an LWS allele that is less strongly red-shifted. They also have different diets and are significantly differentiated at many neutral loci. 2. The mate choice traits that mediate assortative mating at the differentiated islands (female preferences and male nuptial colours) are already variable at the non-differentiated islands. Pundamilia is not unusual in this regard. There is a large number of cichlid populations in Lake Victoria that segregate for the different nuptial colours. 3. Populations from islands with intermediate water clarity are intermediate in that they show strongly bimodal frequency distributions of the mate choice traits, male nuptial colour and female preference, strongly differentiated allele frequencies at the LWS opsin gene, and weakly but significantly different allele frequencies at neutral loci. These populations also show an intermediate level of association between colour and microdistribution; reds have a much wider depth range, while blues are restricted to shallow waters. Most females have strong mating preferences, and these are based on the male coloration. 4. The data are compatible with models of speciation by sensory drive, where divergent light conditions at different water depths and divergent adaptations of the visual system affect mating preferences and the fitness of male nuptial colour morphs. 5. The same nuptial colour cues that females use for choosing mates are also used by males when defending territories against competitors. Evidence gathered from a number of different experiments are consistent with the hypothesis that colour-mediated competition between males contributes a negative frequency-dependent selection component but it is asymmetric and hence unsuitable to stabilize the coexistence of the incipient species without contributions of other mechanisms. 6. Parasitological data have yet to be collected from intermediate sites on the transect to ask whether sexual selection for parasite resistance in different parts of the environment may contribute to divergent selection on mating preferences and colours. Imprinting experiments ought to be conducted with fish from intermediately differentiated and non-differentiated populations to better understand the role of maternal imprinting in the early stages of speciation. 7. The accumulation of divergence in a successively larger number of traits along the Pundamilia ‘speciation continuum’ suggests increasing dimensionality of niche divergence. One potentially important observation then is that the dimensionality of niche divergence can grow rapidly with decreasing gene flow or vice versa, gene flow can rapidly decrease with increasing dimensionality of niche divergence. That divergent daptation and gene flow can be reciprocally constraining has been shown for other incipient species systems too, suggesting a feedback loop between gene flow and selection. If the analogy of the different stages of differentiation on the different islands with successive stages in speciation is valid, the observations in Pundamilia may imply that dimensionality of niche divergence and gene flow restriction co-evolve. A minimum dimensionality of niche divergence may be required for divergent selection to be sufficiently strong to initiate speciation (here the occupation of a sufficiently large range of water depth to be exposed to different selection regimes). However, as soon as gene flow becomes sufficiently reduced, divergence in other traits becomes possible, which may be under less strong divergent selection. The increased dimensionality of niche divergence, in turn, is likely to reduce gene flow further. Female mating preferences can influence both intraspecific sexual selection and interspecific reproductive isolation, and have therefore been proposed to play a central role in speciation. Here, we investigate experimentally in the African cichlid fish Pundamilia nyererei if differences in male coloration between three para-allopatric populations (i.e. island populations with gene flow) of P. nyererei are predicted by differences in sexual selection by female mate choice between populations. Second, we investigate if female mating preferences are based on the same components of male coloration and go in the same direction when females choose among males of their own population, their own and other conspecific populations and a closely related para-allopatric sister-species, P. igneopinnis. Mate-choice experiments revealed that females of the three populations mated species-assortatively, that populations varied in their extent of population-assortative mating and that females chose among males of their own population based on different male colours. Females of different populations exerted directional intrapopulation sexual selection on different male colours, and these differences corresponded in two of the populations to the observed differences in male coloration between the populations. Our results suggest that differences in male coloration between populations of P. nyererei can be explained by divergent sexual selection and that population-assortative mating may directly result from intrapopulation sexual selection. A critical step for speciation in the face of gene flow is the origination of reproductive isolation. The evolution of assortative mating greatly facilitates this process. Assortative mating can be mediated by one or multiple cues across an array of sensory modalities. We here explore possible cues that may underlie female mate choice in a sympatric species pair of cichlid fish from Lake Victoria, Pundamilia pundamilia and Pundamilia nyererei. Previous studies identified species-specific female preferences for male coloration, but effects of other cues could not be ruled out. Therefore, we assessed female choice in a series of experiments in which we manipulated visual (color) and chemical cues. We show that the visibility of differences in nuptial hue (i.e., either blue or red) between males of the 2 species is necessary and sufficient for assortative mating by female mate choice. Such assortment mediated by a single cue may evolve relatively quickly, but could make reproductive isolation vulnerable to environmental changes. These findings confirm the important role of female mate choice for male nuptial hue in promoting the explosive speciation of African haplochromine cichlids. This study compared Pundamilia nyererei and Pundamilia pundamilia males in routine metabolic rate (RR) and in the metabolic costs males pay during territorial interactions (active metabolic rate, RA). Pundamilia nyererei and P. pundamilia males housed in social isolation did not differ in RR. In contrast to expectation, however, P. nyererei males used less oxygen than P. pundamilia males, for a given mass and level of agonistic activity. This increased metabolic efficiency may be an adaptation to limit the metabolic cost that P. nyererei males pay for their higher rate of aggressiveness compared to P. pundamilia males. Thus, the divergence between the species in agonistic behaviour is correlated with metabolic differentiation. Such concerted divergence in physiology and behaviour might be widespread in the dramatically diverse cichlid radiations in East African lakes and may be an important factor in the remarkably rapid speciation of these fishes. 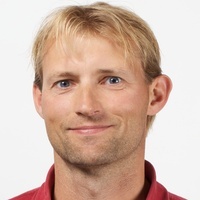 The results did not support the hypothesis that higher metabolic rates caused a physiological cost to P. nyererei males that would offset their dominance advantage. Both inter- and intrasexual selection have been implicated in the origin and maintenance of species-rich taxa with diverse sexual traits. Simultaneous disruptive selection by female mate choice and male-male competition can, in theory, lead to speciation without geographical isolation if both act on the same male trait. Female mate choice can generate discontinuities in gene flow, while male-male competition can generate negative frequency-dependent selection stabilizing the male trait polymorphism. Speciation may be facilitated when mating preference and/or aggression bias are physically linked to the trait they operate on. We tested for genetic associations among female mating preference, male aggression bias and male coloration in the Lake Victoria cichlid Pundamilia. We crossed females from a phenotypically variable population with males from both extreme ends of the phenotype distribution in the same population (blue or red). Male offspring of a red sire were significantly redder than males of a blue sire, indicating that intra-population variation in male coloration is heritable. We tested mating preferences of female offspring and aggression biases of male offspring using binary choice tests. There was no evidence for associations at the family level between female mating preferences and coloration of sires, but dam identity had a significant effect on female mate preference. Sons of the red sire directed significantly more aggression to red than blue males, whereas sons of the blue sire did not show any bias. There was a positive correlation among individuals between male aggression bias and body coloration, possibly due to pleiotropy or physical linkage, which could facilitate the maintenance of color polymorphism. When searching for loci possibly under selection in the genome, an alternative to population genetics theoretical models is to establish allele distribution models (ADM) for each locus to directly correlate allelic frequencies and environmental variables such as precipitation, temperature, or sun radiation. Such an approach implementing multiple logistic regression models in parallel was implemented within a computing program named MATSAM . Recently, this application was improved in order to support qualitative environmental predictors as well as to permit the identi fi cation of associations between genomic variation and individual phenotypes, allowing the detection of loci involved in the genetic architecture of polymorphic characters. Here, we present the corresponding methodological developments and compare the results produced by software implementing population genetics theoretical models ( DFDIST and BAYESCAN ) and ADM ( MATSAM ) in an empirical context to detect signatures of genomic divergence associated with speciation in Lake Victoria cichlid fi shes. A mechanism commonly suggested to explain the persistence of color polymorphisms in animals is negative frequency-dependent selection. It could result from a social dominance advantage to rare morphs. 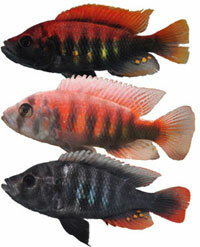 We tested for this in males of red and blue color morphs of the Lake Victoria cichlid, Pundamilia. Earlier work has shown that males preferentially attack the males of their own morph, while red males are more likely to win dyadic contests with blue males. In order to study the potential contribution of both factors to the morph co-existence, we manipulated the proportion of red and blue males in experimental assemblages and studied its effect on social dominance. We then tried to disentangle the effects of the own-morph attack bias and social dominance of red using simulations. In the experiment, we found that red males were indeed socially dominant to the blue ones, but only when rare. However, blue males were not socially dominant when rare. The simulation results suggest that an own-morph attack bias reduces the social dominance of red males when they are more abundant. 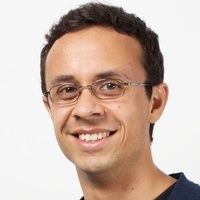 Thus, there is no evidence of symmetric negative frequency-dependent selection acting on social dominance, suggesting that additional fitness costs to the red morph must explain their co-existence. The hypothesis of sympatric speciation by sexual selection has been contentious. Several recent theoretical models of sympatric speciation by disruptive sexual selection were tailored to apply to African cichlids. Most of this work concludes that the genetic architecture of female preference and male trait is a key determinant of the likelihood of disruptive sexual selection to result in speciation. We investigated the genetic architecture controlling male nuptial colouration in a sympatric sibling species pair of cichlid fish from Lake Victoria, which differ conspicuously in male colouration and female mating preferences for these. We estimated that the difference between the species in male nuptial red colouration is controlled by a minimum number of two to four genes with significant epistasis and dominance effects. Yellow colouration appears to be controlled by one gene with complete dominance. The two colours appear to be epistatically linked. Knowledge on how male colouration segregates in hybrid generations and on the number of genes controlling differences between species can help us assess whether assumptions made in simulation models of sympatric speciation by sexual selection are realistic. In the particular case of the two sister species that we studied a small number of genes causing major differences in male colouration may have facilitated the divergence in male colouration associated with speciation. 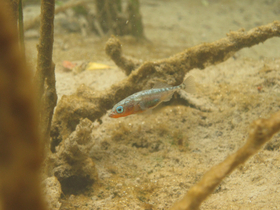 Rapid speciation in Lake Victoria cichlid fish of the genus Pundamilia may be facilitated by sexual selection: female mate choice exerts sexual selection on male nuptial coloration within species and maintains reproductive isolation between species. However, declining water transparency coincides with increasingly dull coloration and increasing hybridization. In the present study, we investigated the mechanism underlying this pattern in Pundamilia nyererei, a species that interbreeds with a sister species in turbid but not in clear water. We compared measures of intraspecific sexual selection between two populations from locations that differ in water transparency. First, in laboratory mate-choice experiments, conducted in clear water and under broad-spectrum illumination, we found that females originating from turbid water have significantly weaker preferences for male coloration than females originating from clear water. Second, both the hue and body coverage of male coloration differ between populations, which is consistent with adaptation to different photic habitats. These findings suggest that the observed relationship between male coloration and water transparency is not mediated by environmental variation alone. Rather, female mating preferences are indicated to have changed in response to this variation, constituting the first evidence for intraspecific preference-trait co-evolution in cichlid fish. 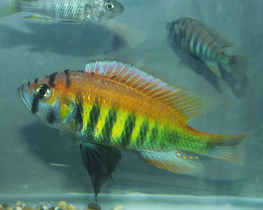 Sexual selection by female mating preference for male nuptial coloration has been suggested as a driving force in the rapid speciation of Lake Victoria cichlid fish. This process could have been facilitated or accelerated by genetic associations between female preference loci and male coloration loci. Preferences, as well as coloration, are heritable traits and are probably determined by more than one gene. However, little is known about potential genetic associations between these traits. In turbid water, we found a population that is variable in male nuptial coloration from blue to yellow to red. Males at the extreme ends of the phenotype distribution resemble a reproductively isolated species pair in clear water that has diverged into one species with blue-grey males and one species with bright red males. Females of the turbid water population vary in mating preference coinciding with the male phenotype distribution. For the current study, these females were mated to blue males. We measured the coloration of the sires and male offspring. Parents-offspring regression showed that the sires did not affect male offspring coloration, which confirms earlier findings that the blue species breeds true. In contrast, male offspring coloration was determined by the identity of the dams, which suggests that there is heritable variation in male color genes between females. However, we found that mating preferences of the dams were not correlated with male offspring coloration. Thus, there is no evidence for strong genetic linkage between mating preference and the preferred trait in this population. Divergent selection acting on several different traits that cause multidimensional shifts are supposed to promote speciation, but the outcome of this process is highly dependent on the balance between the strength of selection vs. gene flow. Here, we studied a pair of sister species of Lake Victoria cichlids at a location where they hybridize and tested the hypothesis that divergent selection acting on several traits can maintain phenotypic differentiation despite gene flow. To explore the possible role of selection we tested for correlations between phenotypes and environment and compared phenotypic divergence (PST) with that based on neutral markers (FST). We found indications for disruptive selection acting on male breeding colour and divergent selection acting on several morphological traits. By performing common garden experiments we also separated the environmental and heritable components of divergence and found evidence for phenotypic plasticity in some morphological traits contributing to species differences. Cichlid fishes are famous for large, diverse and replicated adaptive radiations in the Great Lakes of East Africa. To make a start towards understanding what molecular mechanisms may have played a role in the rapid origins of cichlid phenotypic diversity, a large group of cichlid researchers under the leadership of the Broad Institute sequenced the genomes and transcriptomes of five lineages of African cichlids: the Nile tilapia (Oreochromis niloticus), an ancestral lineage with low diversity; and four members of the East African lineage: Neolamprologus brichardi/pulcher (older radiation, Lake Tanganyika), Metriaclima zebra (recent radiation, LakeMalawi), Pundamilia nyererei (very recent radiation, LakeVictoria), Astatotilapia burtoni (riverine species around Lake Tanganyika). We observed several remarkable and interesting patterns. We saw what seems to be an excess of gene duplications in the ancestor of the East African lineage compared to tilapia and other teleost fishes, an abundance of non-coding element divergence, accelerated coding sequence evolution, expression divergence associated with transposable element insertions, and regulation by novel microRNAs. We analyzed Restriction Site Associated DNA (RAD) sequence data from sixty individuals representing six closely related species from Lake Victoria, and showed that differentiation among these extremely closely related and occasionally hybridizing species affects many regions on all chromosomes, includes coding and potentially regulatory variants, and quite a few of these were recruited from ancient polymorphisms that by far predates the origin of the radiation. We interpret these data as evidence for amassing of standing variation prior to the onset of radiations, possibly associated with periods of relaxed purifying selection. It will be interesting in the future to investigate whether this period of relaxed selection may have been important in facilitating subsequent evolutionary diversification. A fundamental challenge to our understanding of biodiversity is to explain why some groups of species undergo adaptive radiations, diversifying extensively into many and varied species, whereas others do not. Both extrinsic environmental factors (for example, resource availability, climate) and intrinsic lineage-specific traits (for example, behavioural or morphological traits, genetic architecture) influence diversification, but few studies have addressed how such factors interact. Radiations of cichlid fishes in the African Great Lakes provide some of the most dramatic cases of species diversification. 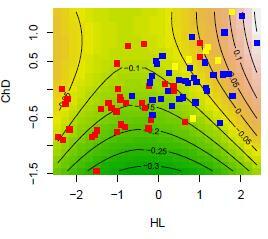 However, most cichlid lineages in African lakes have not undergone adaptive radiations. We have compiled data on cichlid colonization and diversification in 46 African lakes, along with lake environmental features and information about the traits of colonizing cichlid lineages, to investigate why adaptive radiation does and does not occur. We find that extrinsic environmental factors related to ecological opportunity and intrinsic lineage-specific traits related to sexual selection both strongly influence whether cichlids radiate. Cichlids are more likely to radiate in deep lakes, in regions with more incident solar radiation and in lakes where there has been more time for diversification. Among the suite of intrinsic traits that we investigate, sexual dichromatism, a surrogate for the intensity of sexual selection, is consistently positively associated with diversification. Thus, for cichlids, it is the coincidence between ecological opportunity and sexual selection that best predicts whether adaptive radiation will occur. These findings suggest in order to predict adaptive radiation, species traits and environmental factors have to be considered jointly. We are currently extending this approach to other fish radiations. Adaptive radiation’s hallmark is exceptional species richness within geographically restricted clades. Although understanding the factors influencing geographical patterns of species richness is a fundamental goal of ecological research, adaptive radiations have rarely been studied from macroecological perspectives. Decades of ecological research have uncovered strong and predictable relationships between ecological variables (e.g. area, productivity) and species richness. These same variables may influence processes of species origination and the occurrence and richness of adaptive radiations. For example, habitat size may influence in situ speciation and adaptive radiation. Adaptive radiations are often characterized by slowdowns in diversification rate through time, assumed to derive from niche-filling processes. If adaptive radiations have reached this slowdown phase, there should be clear relationships between species richness and environmental variables related to resource availability, if these variables limit species richness. However, rarely have such environmental variables been identified for adaptive radiations. We investigate these hypotheses using our data set for 48 African lakes. Recently we discovered that within-lake adaptive radiation strongly modifies the species-area relationship for African cichlid fishes. The total number of species derived from in situ speciation increases with lake size, resulting in faunas orders of magnitude higher in species richness than faunas assembled by immigration alone. 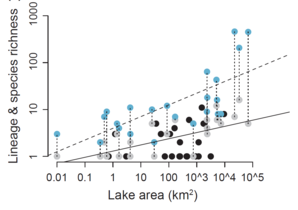 We found that diversity of clades representing within-lake radiations show responses to lake area, depth and energy consistent with limitation by these factors, suggesting that ecological factors influence the species richness of radiating clades within these ecosystems.